As a Christian pastor assigned to a disaster relief project in Bangladesh, Toshihiro Takami witnessed the desperate survival struggle that followed the murdering floods of 1970. Discerning a dearth of capable and committed local leaders, he determined to establish an institute dedicated to providing them training and skills to increase their capacity to serve their people. In 1973, “in response to God’s calling,” he says, “we moved to found the Asian Rural Institute,” or ARI. Takami’s youth was marked by hardship and war. To educate him beyond grammar school, his impoverished parents apprenticed Takami to a Zen monastery in Kyoto. At the age of eighteen, just months before the end of World War II, he enlisted in the Japanese navy and briefly attended radar school. Hard times followed as he fended for himself and his family in post-war Japan, mostly as a manual laborer. 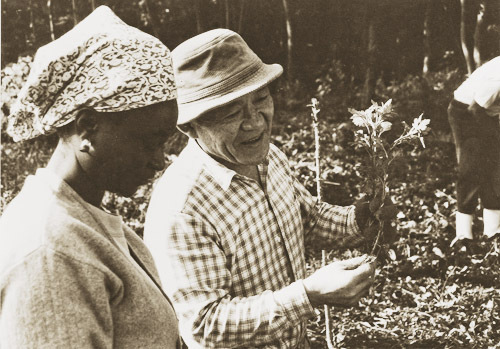 But in 1951, Takami found work as a cook for a Christian missionary. He began studying Christianity. Soon he was baptized. A youth organization in the United States then sponsored him to attend Doane College in Nebraska. By 1960 he had earned his bachelor’s degree, graduated from Yale Divinity School, and become an ordained minister in the United Church of Christ, Japan. Back in Japan, for ten years Takami taught practical theology and directed the Southeast Asia Christian Rural Leaders’ course at the Theological Seminary for Rural Mission in Tokyo; work that led to his eye-opening field assignment in Bangladesh and the founding of the Asian Rural Institute. Takami designed the institute’s curriculum around intensive, small-scale, organic farming, and animal husbandry, linking these activities to building a vibrant community. All participants, including staff, engage daily in dirty-hands chores at the institute. And all take their turns preparing food for the group’s common meals. “Sharing food is sharing life,” is one of Takami’s most well known phrases. ARI participants also share in decision making. 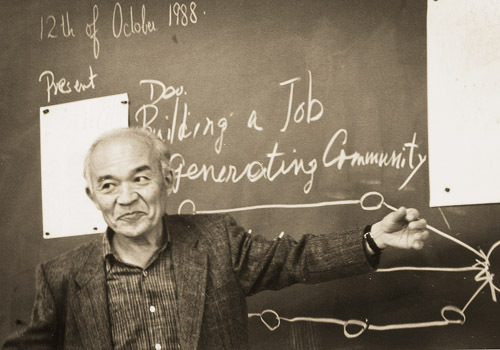 The difficult process of achieving consensus among a group of strong-minded, quick-to-action people, Takami believes, helps ARI’s rural leaders become more effective change-makers in poor communities. Our motto at ARI is “That We May Live Together.” Participants come to work hard in order to return to their own people to work and live even harder. Not only Protestant and Roman Catholic Christians, but also Muslims, Hindus, Buddhists and others share the life at ARI. For we believe the love of God in Jesus Christ is for all peoples and not only for us who confess our faith in Him. In fact we believe that by sharing life with others, we too may have the joy of living ourselves. ARI is a very hard community to live in. Participants come from widely different backgrounds — socially, politically, religiously, culturally. Only those who are strongly motivated, deeply dedicated and experienced leaders come to ARI. Many of them seem to have common characteristics of being strong-minded, power-conscious, quick for action, rather domineering, above average ability and with a high degree of self-esteem. Each day we go through the difficult process of making corporate decisions — as consensus, not compromise. Each person — man or woman, young or old, rich or poor, strong or weak — has equal right and responsibility to participate. We know “people’s participation in human development” is an indispensable key to realizing justice and peace. But this is easy to say and difficult to practice. Each of us must learn to be a good listener — especially to the poor and weak, the voiceless. At the same time, each person needs to become an articulate but not necessarily an eloquent speaker. Eventually each one learns to be a trustworthy spokesperson of his or her own community, in word and deed. One of the most critical, painful and difficult experiences each person goes through at ARI is a process of image change. With such a variety of cultural backgrounds and values, the self-images of participants differ greatly. Equally varied are the images they hold of a desirable community. These images are important. They set the limits of what each Participant is going to be. They determine what kind of world he or she will try to build. We often observe Christian leaders consciously or unconsciously assuming an image of a leader according to their own cultural tradition — quite often dictatorial, paternalistic, or in keeping with an image of their former colonial masters. Many come to ARI with their own images of a training institute. They expect it to be a conventional “academic institution” rather than a community of learning through a process of personal encounter. These Participants suppose that a set of normally accepted subjects in agriculture and social sciences will be taught by experts to students. Instead, what happens is that people have to go through the pain of creating for themselves a community of learning. In the process, each person has to find a new image — quite different form the one they came with. Pastors, priests, school principals and others often find it very difficult to engage in physical labor — “spoiling” or “dirtying” their hands and knees. They think it is below their dignity to take a shovel or a broom to scrape up chicken or pig dung. Leaders are not supposed to do that: manual labor is below their self-image. Every year we hear some participants murmur, “We did not come to ARI to work in the mud. We came to Japan to study.” People become indignant when their expectations are not met. We need to learn to listen to these indignant murmurs. In this painful process of having our conventional images shattered, we find ourselves emerging with new images — of ourselves, of leadership, life and culture. All this happens as we work together to produce and share food and other resources. In other words, we go through a process of renewal — renewal of ourselves and our community. And in doing so we learn how to stimulate and direct the process of constant renewal in other communities. To be involved in this renewal is to share in the work of creation by God our Father. This process of renewal-creation is painful — we participate in it with groaning and with hope because in the experience of personal encounter we find the One who is the source of life. Here we find a new image of humanity as most clearly shown to us in the person of Jesus Christ — in His life and suffering for others. We believe all this forms a life-long process of evangelism. For evangelism is a continuing act of proclaiming with our own life and work the Good News that we are ever-renewable people as we painfully participate in the work of God’s creation.